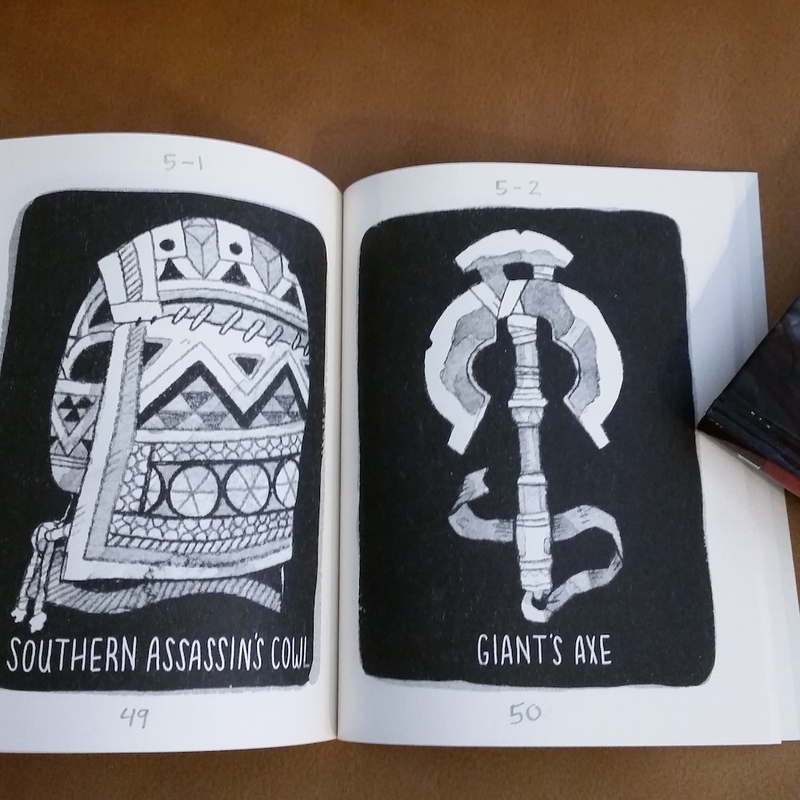 Inventory v.1 is a small paperback by Sam Bosma with labeled illustrations of items an adventurer in a fantasy setting might carry. That is all. It is a nice mix between mundane and fantastic, humorous and serious, functional and superficial. Immediately, my mind went to using the book as a trinket table for starting PCs. There are 71 items, and they are not numbered. This is a somewhat awkward total to use as a random table. One could always roll 1d100 and re-roll results above 71, but 29% inefficiency is unsatisfying. There is a solution, however: the d6-12 table. This is a variation on the d6-6 table, where one rolls 2d6 and reads the results as a number base 6. A d6-6 table has 6 * 6 = 36 entries. Happily for my purposes here, a d6-12 table has 6 * 12 = 72 possibilities, leaving one extra for the blank page at the end. (I put “roll again or choose” there.) So, to determine an item randomly, roll a d6 and a d12 and look up the relevant page. 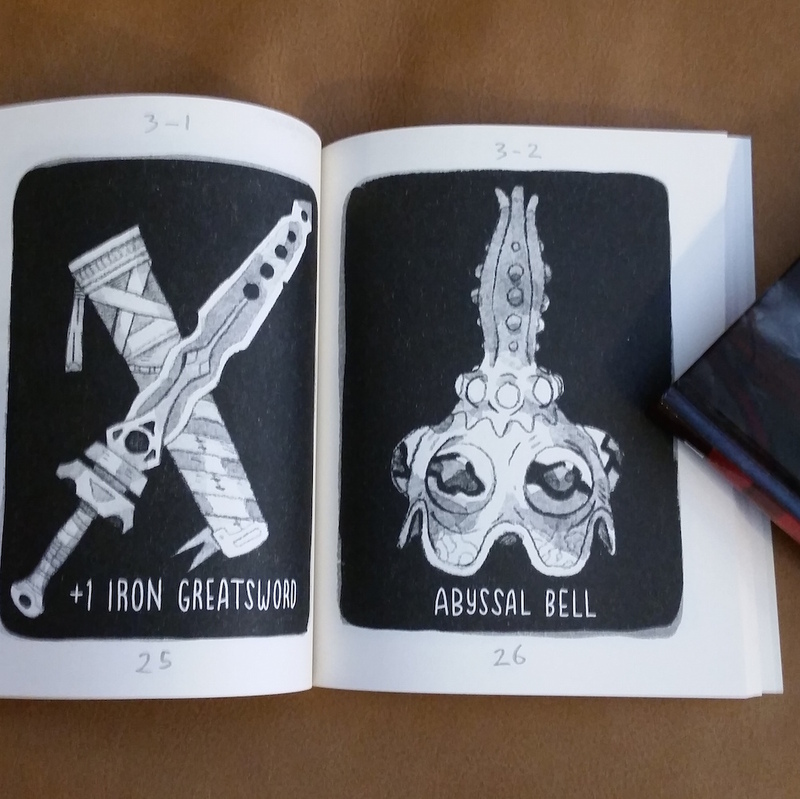 Since the pages are not numbered, I wrote in the d6-12 numbers for each item (as you can see in the pictures). In addition to use as a collection of starting trinkets, each item could come along with a characteristic ability. For example, beginning with the Giant’s Axe might grant the ability to wield gigantic weapons (OD&D rules: 5 encumbrance slots but a full additive 2d6 damage). Beginning with the Abyssal Bell might come with fluency in the language of demons (and the bell itself summons a demon when rung; consult either the AD&D DMG Appendix D or the LotFP summon spell). 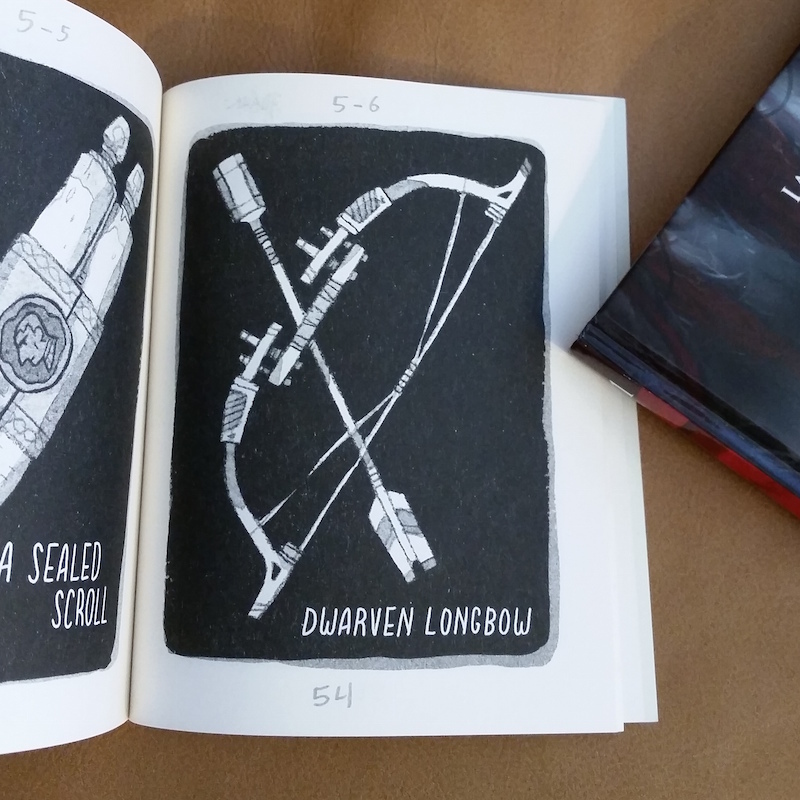 You can buy Inventory v.1 here. As far as I know, it is only available in hardcopy softcover. Some sample pictures are included below. 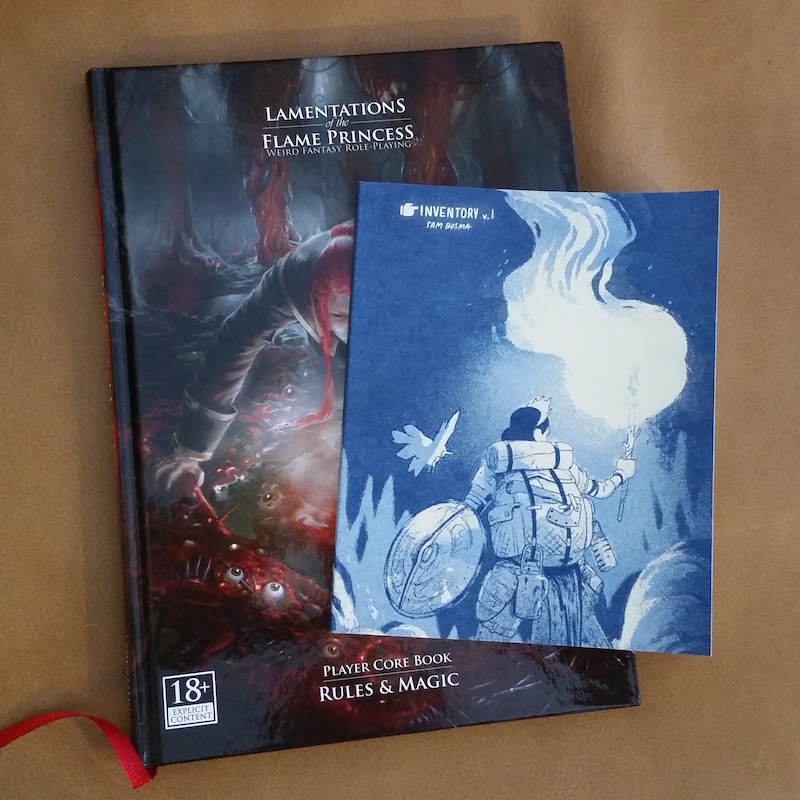 LotFP Rules & Magic (A5 size) included for scale. Sam also has an art tumblr. 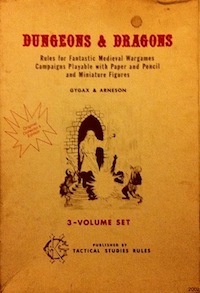 I have been thinking about putting together a basic, portable DM box for myself (something about the size of the original white box with a base rule set or two, dice, a Moleskine full of dungeons, etc). When I get around to that, I think I will include this little book too. This entry was posted in Bibliophilia, Reviews on June 8, 2015 by Necropraxis. this is easily one of the best RPG things I ever bought. I love it. i have a post in the pipline over at my site where i stat a lot of the items. One of the great things about most of these items is that it is relatively easy to improvise interesting effects even lacking such predetermined details.